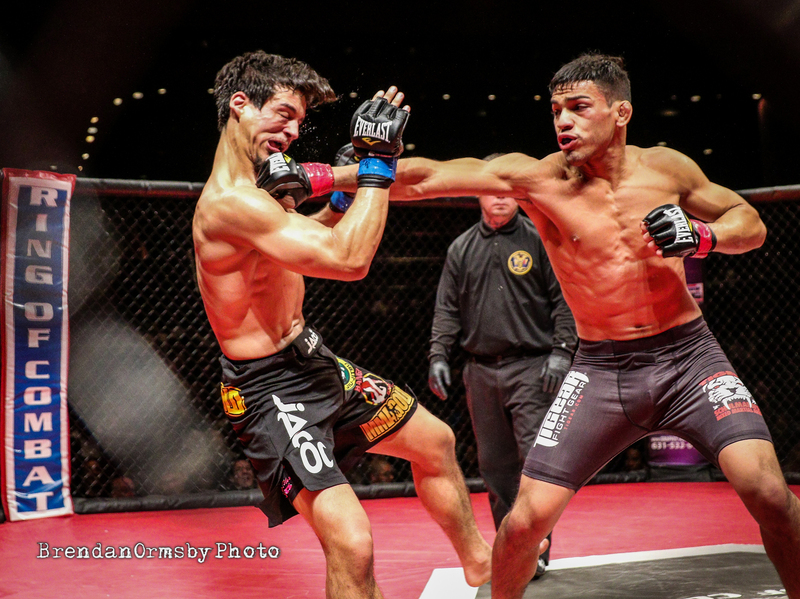 Julio Arce Ready For War | Lou Neglia's Ring of Combat | Next Generation of Mixed Martial Arts! It was June of 2013 when a new face came on to the professional fight scene. Though it wasn’t his debut it was the first time Ring of Combat fans got a chance to see this new kid on the block. This was the night they saw Tiger Schulmann’s bantamweight star, Julio Arce (9-2), cruise to a unanimous decision. With his superior footwork and lightning quick combinations, Arce quickly established himself as one of the best bantamweights on the regional MMA circuit blitzing past every opponent and compiling a record of 4-0 before challenging for the ROC bantamweight title. He would defeat Jason McLean via unanimous decision to pick up gold. Arce would go on to defend his title three times improving to 8-0 before suffering a pair of losses to Brian Kelleher. Not one to dwell on defeat, Arce would travel outside of ROC and outside of the bantamweight division to pick up a win as a featherweight by second round submission over Francisco Isata at CFFC. Now Arce is back at the Tropicana and ready to perform for the diehard ROC fans. “For me it's awesome fighting at ROC,” said Arce. “Every promotion I am in they have treated me amazing and ROC has been amazing to me every time so I am pumped to be back,” Arce continued. And welcoming Arce back is ROC Featherweight Champion, Frank Buenafuente (7-2), who is riding a five-fight win streak and picked up the ROC title in the process. Arce knows that Buenafuente is not one to take likely. “He's the champ and I was a former champion there,” said Arce. “He is tough I am tough and he will bring it and so will I. It's going to be an amazing fight,” Arce continued. When asked what can fight fans expect when Arce steps into the cage at the Tropicana, he had this to say, “A healthier non sucked out Julio Arce [that’s] ready to leave it all in that cage November 18 and a super excited person ready for war,” Arce concluded. Julio Arce meets Ring of Combat Featherweight Champion, Frank Buenafuente, Friday, November 18 at the Tropicana Atlantic City showroom. Tickets can be purchased at the Tropicana box office, any TicketMaster outlet or from the ROC website. Get yours today!! !